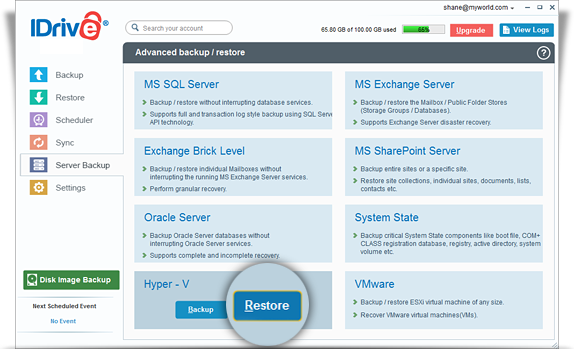 Restore your virtual machines in case of any system failure or disaster. Locate and select the 'IDHyperVBackup\IDHyperVData' folder in your IDrive account. Click the 'Restore Now' button, to restore the 'IDHyperVBackup\IDHyperVData' folder to the local computer. Once the 'IDHyperVBackup\IDHyperVData' folder has been successfully restored, click the 'Server Backup' tab. In the Hyper-V section, click Restore. Select the virtual machines you want to restore to your Hyper-V server. Browse and choose the 'IDHyperVBackup\IDHyperVData' folder (restored earlier from your IDrive account). The Hyper-V backup/restore screen is displayed. Click the 'Restore Now' button to restore the virtual machine to the Hyper-V server.